Spectrum Surgical is pleased to offer a full line of Clear Flush™ Kerrison Rongeurs and Laparoscopic Instruments to help remove infectious bio-burden. 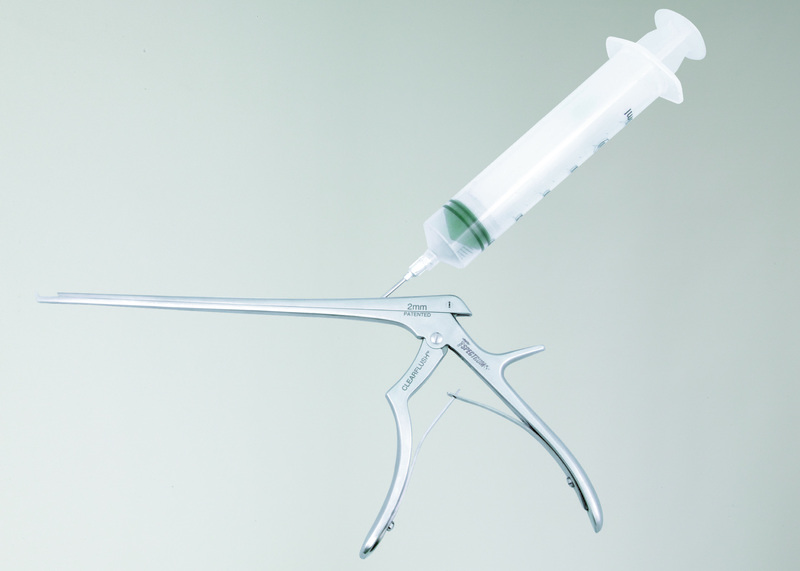 Spectrum Surgical is pleased to now offer a full line of Clear Flush™ Kerrison Rongeurs and Laparoscopic Instruments. Spectrum’s Clear Flush™ instruments employ a patented internal design that facilitates removal of virtually all infectious bio-burden from “inside” the instrument with a simple 50cc flush and provides you with 100% bacteria kill on every cycle. This unique design gives you validated removal of 99.9998% of infectious bio-burden with a single flush, and improved internal steam penetration to permit 100% bacteria kill. In addition, the instrument provides enhanced lubrication for longer life and improved tactile feel. Clear Flush™ is clean on the inside, every time, for every patient. Spectrum Surgical takes pride in offering a variety of surgical instrument care products and services. Contact a Spectrum customer care representative at 800-444-5644 to find out more or visit our website: spectrumsurgical.com.